Spotted Wintergreen is such an interesting wildflower as the waxy white flowers droop down to the earth until they bloom and then they face the sun. The Spotted Wintergreen is very similar to a wildflower that I used to see in Colorado called Pipsissiwa which has solid green leaves. Spotted Wintergreen grows from 4-10″ with 1″ flowers. They bloom in July and August in the woods so you still have plenty of time to find them. 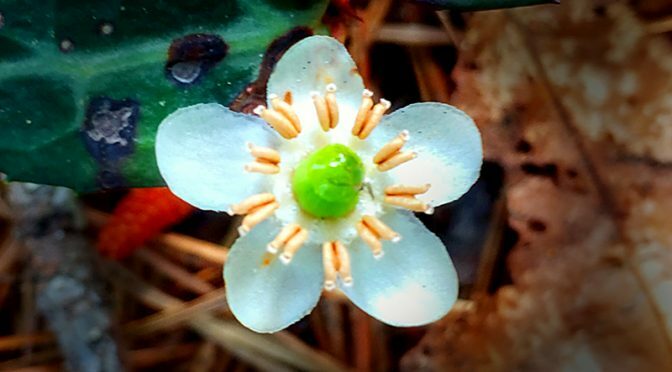 Have you ever seen a Spotted Wintergreen wildflower? Pretty cool looking flower, don’t you think? Very pretty and very unusual. Kind of reminds me of one of my mother’s earrings from the 1950s! Yes, it does! Too funny!